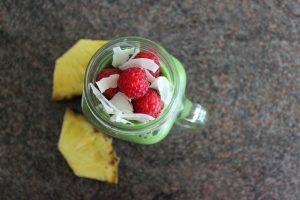 A rich and creamy green smoothie with a delicious, tangy twist from the kiwi and pineapple. Sounds good, right? Ever since I made this smoothie, I’ve been obsessed with it! If you know me, you’ll know that I love smoothies. My obsession with them started at the beginning of this year, a few months before I became vegan, but back then I only had access to a very old, worn out blender, and let me just tell you, it did not appreciate all the frozen fruit I tried (keyword: tried) to make it blend. Most of the time the blender just made weird noises, making me think it was about to explode. And if that wasn’t enough, it took years, literally, to make a smoothie that always ended up very lumpy anyways. Luckily, at my confirmation, I recieved a brand new one from my uncle, that I, ever since that day, have been using almost daily. It’s a high speed blender, so it can take on most challenges. Maybe it’s not in the same league as the vitamix, but I would say it’s close. At least it satisfies my needs. I even eat smoothies for breakfast now. I’ve joined the smoothie bowl-club, but really? Is there any reason not to? Delicious, refreshing smoothies, topped with all your favourite things (mine including chia seeds, coconut flakes and berries), so they not only look amazing, but taste amazing, too. And as an added bonus they’re super healthy, so you can eat them any time you’d like. Breakfast, dinner, dessert… you name it! Of course there’s nothing wrong with my 2 regular smoothies. Maybe you’ll even see them on the blog one day. Sometimes it’s just healthy to vary your meals a little. So I tried to do that a couple of days ago. I had a pineapple standing at the table, and some kiwis that I’d normally put on top of my smoothie bowl to make it look extra fancy. But that day I decided to do something different. I put pineapple and kiwi in my smoothie, and then I wondered why I’d never done that before. 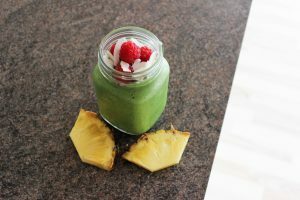 Because the result was this incredible smoothie with a tangy twist from the pineapple and kiwi, but still a deep and creamy feeling from the banana. It tastes like a dream, and maybe, with it’s tropical taste, I can even manage to dream myself away from the crappy weather, we’re having in Denmark, down somewhere south. This smoothie didn’t come out as thick as the other smoothies I’ve made, maybe because it contains more fresh fruit. However, it’s more flavourful. And even though it’s not that thick, you can still eat it as a smoothie bowl. I’ve done it. Heavier toppings will just sink to the bottom. I used maca powder in my smoothie, but you don’t have to do that, if you don’t have it or can’t afford it. The maca powder is just a little #extrahealth. If you don’t already know, maca powder is a so-called superfood, meaning it contains a lot of essential vitamins and minerals. Maca powder comes from the maca root, which grows at the Andes Mountains in Peru, but I can go more into depth about the whole maca topic in another blog post, if you’d like. No matter what, this recipe is great for hiding the maca flavour, if you’re not a fan of it, like me. This smoothie is definitely a good competitor to my usual smoothies. Rich and creamy, nutritious smoothie with a tangy and delicious twist! 1. Start by preparing your fruits and vegetables. Wash the spinach, an remove the skin from the pineapple slice. You can also cut the skin off of the kiwi, if you prefer, but usually I keep mine on. Cut the fruits into smaller pieces. 2. In a blender, first add the spinach, then the fresh fruit and lastly the frozen banana along with the other ingredients. This will make the process easier for your blender. 3. Start by blending at low speed for about 5 seconds, then switch to medium speed and let it blend until the smoothie is nice and creamy, approximately 20 seconds. 4. Serve and enjoy either in a glass or bowl!